This all-purpose yogurt dough is awesome because it is so versatile. It is fast, simple, and can be used for many things: pizza pies, pie crusts, cookies, and whole grain crackers. This is a basic recipe that can be used often. This recipe is soaked, so you do not have to rely on sprouted flour (which is very expensive to buy around here). By soaking, the phytic acid is more readily neutralized, and people have an easier time digesting it. Remember this recipe is versatile, so play around with it! Go check out Our Nourishing Roots, a blog about Real Food recipes. 1. In a large mixing bowl, combine yogurt and butter. Add flour and salt, mixing with a wooden spoon until too difficult. Use fingers to completely combine. 2. 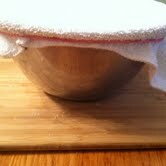 Cover with a towel and a dinner plate to keep dust and bugs out, but to allow it to breathe. Let soak in a warm place for 12-24 hours. 3. 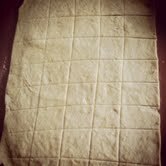 The next morning, remove the dough and roll out with flour to the desired shape and thickness. 4. For crackers, I roll 1/8-inch thick and bake at 375 degrees for about 15-20 minutes or until browned. 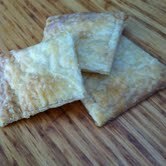 These crackers taste remarkably like cheese crackers, even though they contain no cheese! Great recipe, I can’t wait to try this! Let us know how it goes. I really think it will be great w/ pies. On my list of things to make.